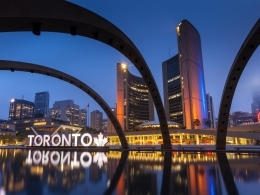 Toronto has everything: music, dance, comedy, theatre, sports, galleries and museums. An active waterfront on the shores of Lake Ontario which includes Harbourfront Centre and Ontario Place. Canada enjoys four very distinct seasons, particularly in the more populated regions along the US border. Daytime summer temperatures typically 26-30°C while winters are typically -5°C. More moderate temperatures are the norm in spring and fall. Major credit card companies in Canada: American Express, Visa and Master Card. Standard banking hours: Monday to Friday from 9:30 until 16:30. Some banks and specific branches may be open later and even on Saturdays and Sundays. 110 V; 60Hz - 2 flat-pin plug. Tap water is safe unless there’s a sign to the contrary. If you have a medical emergency, go to the emergency department of the hospital closest to you. Take some identification with you, and your insurance policy number. Some hospitals may ask you to pay a fee. Keep the receipt to send to your insurance company for payment. For Emergencies call 911. Minimum age to rent a cars is 21. Additional charges may apply to drivers 21 to 24 years of age. Most rental companies require that you have an international driving license, a second form of identity and a major credit card. Legal age for drinking in Toronto is 19 and many places will ask for identification. Legal age for smoking in Toronto is 18. Smoking is prohibited in all buildings, including all restaurants and bars. Smoking is permitted outside. If you smoke in a “smoke free” place, you may receive a fine of up to $5000. All EC Toronto students must be covered by health insurance for the entire length of their stay. EC can help students to purchase insurance upon arrival at the school. The cost of insurance is $14 Cdn per week. Students will be asked to show proof of coverage on arrival if they are not purchasing insurance through EC.